Chitwan is one of the most impoverished regions of Nepal. Many parents cannot afford to send their children to school, and some social groups are still discriminated against. Without support, children will face a life in poverty when they grow up. The city of Bharatpur is the capital of Chitwan district in central-southern Nepal and has a population of over 143,000. Chitwan Valley is predominantly agricultural with rice and mustard being the main crops. But Bharatpur, like many cities in Nepal, has been expanding rapidly in recent decades, and much of what was formerly agricultural land is now used for residential or commercial purposes. Landless tenants, rural women and subsistence farmers are finding it increasingly different to make a living due to land and policy reforms. Many of them therefore move to the city. In recent years, the city has experienced growth of over seven per cent per year, making it one of the fastest-growing cities in the world. This population expansion also means increased pressure on the city’s infrastructure. Although the municipality has implemented a number of projects to improve living conditions, progress is slow. Currently, only around 60 per cent of local residents have access to clean drinking water. Sanitation, waste water management, roads, drainage as well as education on matters of personal hygiene are also lacking. The decade of violent conflict that marked Nepal’s recent history had a devastating effect on the lives of countless children. Thousands of families were displaced, children were orphaned or they lost the care of their parents due to other social and economic reasons. The education sector suffered greatly as many schools were shut down or used for military purposes. To this day, access to education and medical treatment remains limited, especially for women. The poorest sector of Nepalese society is the caste of the Dalits, the so-called “Untouchables”. They were historically considered “unclean by birth” and although they enjoy some legal protection today, 90 per cent of Dalit women still live below the poverty line and they experience discrimination and human rights abuses. For poor families in Nepal, it can be as good as impossible to send their children to school as parents need to cover the costs of registration, monthly tuition fees, school books and uniforms, and any other materials needed. Without support, many parents are unable to do this. 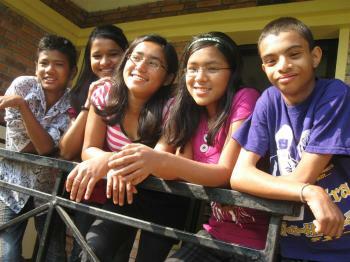 SOS Children’s Villages began its work in Bharatpur in 2003. Strengthen families: Our social centre here offers a family strengthening programme to members of the surrounding communities, which aims to identify struggling families and provide all the support they need so that their children will be safe and healthy and can attend school. We grant scholarships for school fees, text books and school uniforms to children and we run a day-care centre where working parents can leave their children during the day. We also provide counselling and information on health and hygiene issues so that parents can care for their children as best as they can. Care in SOS families: For children from the region who are no longer able to live with their parents, 14 SOS families can provide a loving home. In each family the children live with their brothers and sisters, affectionately cared for by their SOS mother. Education: Children attend the SOS Kindergarten and the SOS Hermann Gmeiner School, where they are taught together with children from local families, which helps them become part of the community. The school offers primary and secondary education for almost 500 pupils. Support for young people: Once the children reach adolescence, they usually move on to the SOS Youth Programme when they start vocational training or go on to higher education. With the support of qualified counsellors, the young people develop perspectives for their future, learn to shoulder responsibility and increasingly make their own decisions. They are encouraged to develop team spirit and build up contacts with relatives and friends, as well as with the relevant authorities and potential employers. Emergency assistance: After the strong earthquake caused widespread damage and suffering, SOS Children’s Villages co-workers from SOS Children’s Village Bharatpur offered emergency help - in the form of food, first aid, water and shelter - to families in need. We also set up a Child-friendly space where children could be cared for and given food during the day.